You can do everything from relaxing in the grounds on the sun loungers to hiking, river rafting fishing, horse riding etc. There are many varied walks and hikes for people of all levels either starting from the house or commencing a short drive away. Bathing and swimming are possibly in the many local fresh water pools, waterfalls and rivers (10 - 15 mins) and the beaches of the Mediterranean are 1 hr. drive from here. The local tourist offices in Lasalle and St Hippolyte du Fort can give you a wealth of information on the various castles, museums and wineries to visit during your stay here. The area is steeped in local history and tradition, concerning the former silk industry; the ever continuing olive industry (a mill can be visited 20 mins from here) and the chestnut industry and its products can be bought and tasted there. There is a market every morning of the week in the local surrounding villages. The markets in Lasalle 5 mins drive on Mondays; St Hippolyte 10 mins drive on Tuesdays and Thursdays; Anduze 15 mins drive, Ganges 30 mins, and Uzes 60 mins. 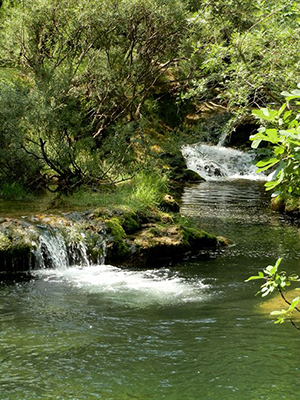 Anduze is a lively bustling little town, with great places for a swim. You can visit the bamboosarie, the many ancient traditional potteries and the Cevennnes steam train. It’s also a great place to have lunch or go out for an evening meal. Visiting Uzes is a must and 15 mins further on is the magnificent Pont du Gard – the two together make a wonderful day out, all including perhaps Avignon. The famous towns of Avignon, Arles, Orange can also be visited in a day trip from here; as can the wonderful Carmarge district, with towns such as St Maries de la Mer. Visiting the ancient walled town of Aigues Mortes is fascinating and can be combined with the beach. Slightly further a field is the Cathar district and the mysterious town of Rennes-Les-Châteaux with connections to The Holy Grail and also closer by is the Knights Templar town of St Guillhem le Désert and the grotte des Demoiselles. There are also many local ruins and restored castles to walk to or drive to from here. We have views of the Medieval castle château Castellas from our terrace. There are also many ancient stone circles and meniths that can been seen in the area. A visit to the latest modern motorway bridge - the highest bridge in the world - Le viaduc de Millau designed by Norman Foster makes a great day out taking in the mediaeval town of Pezenas with its great antiques market. Not forgetting of course the ancient roman town of Nimes and the lively University town of Montpellier.